Home » Episodes » Episode 11: Disney Holidays! Welcome to the 11th episode of the DFB Podcast! For this episode’s main segment, AJ and Brad discuss Walt Disney World and Disneyland holiday events and specialty food items available only during this time of the year! Q: Chris H.: I’m heading out to Disneyland for the first time with my girlfriend next year and I was wondering what your top pick is in these categories: high-end sit down, medium tier sit-down, and counter service. Thank you! Q: Shane G.: How do you encourage a picky eater or someone set in their ways to step outside their comfort zone at Disney? Every time my sister comes to visit me in Orlando, she always insists we eat at Tony’s Town Square because she believes there is some great family memory or tradition held there. No one else in the family believes this and I just see Tony’s as high-priced mediocre Italian food. I especially want her to try new things because we have a reservation at Be Our Guest on opening day for her Thanksgiving trip. What two restaurants in the Magic Kingdom host dance parties during Mickey’s Very Merry Christmas Party? 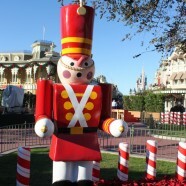 About the Picture: This toy soldier stands sentinel in Town Square in Disney World’s Magic Kingdom during the holidays! More Holidays: See photos of the 2012 Walt Disney World Gingerbread Holiday Displays and be sure to read more about The “DFB Guide to the Walt Disney World Holidays 2012″ Grand Launch and Discount! Thanks for listening!! Please rate and review the podcast on iTunes, and leave your comments right here! Thank you! Fantastic job, very informative, and a delight to listen to! Happy holidays! No Starbucks in the Magic Kingdom! Many people visit Disney because it is a magical place that is removed from the outside world. Starbucks will only ruin this illusion. I don’t really care about the whole Starbucks at MK thing. One good thing, it will help a little with people complaining about the crappy regularly available coffee. Also, I don’t drink coffee or black tea and at Starbucks I will be able to get a Calm tea with honey – herbal tea is very hard to find at WDW. I’m a little disappointed that Starbucks is coming to the Magic Kingdom, although if they keep the Main Street Bakery’s pastries and the such intact it won’t be such a big deal. I have a trip planned for next year in late Nov/early Dec, so I’m looking forward to the holidays and all that comes with it at Disney. Thanks for the tips and info from his Podcast!